The National Institute for Occupational Safety and Health has developed a list of leading work-related diseases and injuries in the United States, and included on that list is high levels of manganese exposure that can produce psychoses and suicidal tendencies, most commonly found in welders. Manganese exposure is especially dangerous because unlike other large outbreaks of neurotoxic disorders, manganese has a subtle and slow effect on the body. Chronic exposure to high levels of manganese can affect the central nervous system and is called manganism. Manganism has been linked to Parkinson's disease, the progressive impairment or deterioration of neurons in the brain area substantia nigra. Due to the similarity of this work hazard to non-occupational diseases, like Parkinson's Disease, manganese-exposure is often unidentified as a workplace disease. Physicians are also not trained to take a complete enough medical history to evaluate if medical disease or illness is present. Chronic exposure to manganese can cause manganism and has been linked to Parkinson's Disease. Although it is difficult to recognize the dangers of manganese because of the subtle and slow symptoms it produces, it is workers should be aware of signs, especially if in the welding industry. Manganism, like Parkinson's, is a progressive movement disorder that is characterized by slow movement and tremors that can affect one side more than the other. A pattern of slowing motor functions, increased tremor, reduced response to speed, enhanced olfactory sense, possible memory and intellectual deficits, and mood changes can indicate the worker has manganese neurotoxicity present. If you are a welder and have been exposed to welding fumes testing is advised. 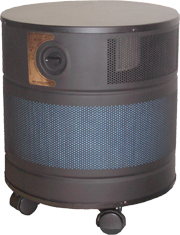 Your source of Allerair air filtration system, air purifier, air cleaner, air scrubber and genuine Allerair replacement filters and parts. 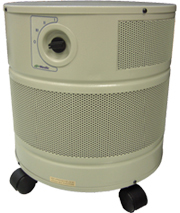 Indoor Air - "Mold Remediation in Schools and Commercial Buildings"
MODEL 9700S / 9750S / 9775S versatile models for chemical fumes, toxic gases, odor control, tobacco smoke reduction and / or removal - up to 40 lbs. of activated charcoal / carbon media.